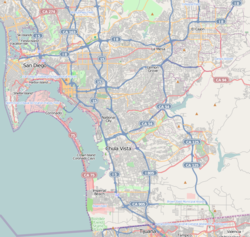 South San Diego is a district within the City of San Diego, and is in the larger South Bay region of southwestern San Diego County, California. South San Diego is an exclave of San Diego, having no land connection with the rest of the city. It is the only part of the city which borders Mexico. Before the arrival of the Spanish explorers, area of South San Diego was inhabited by the Kumeyaay people. The Kumeyaay, also later known as the Diegueño, traveled the region this is evidenced by the shallow depressions in boulders that were used for grinding acorn into meal, that are found throughout the area. John J. Montgomery achieved the first controlled flight with a heavier-than-air flying machine in the United States when he successfully flew three glider aircraft designed in the period 1883-1886 from Otay Mesa. A monument to his historic flights is known as Silver Wing Park, located on Coronado Avenue, just east of Beyer Boulevard. The Interstate 5 freeway in this region was later named the John J. Montgomery Freeway in his honor. In 1957, the area comprising South San Diego was annexed by the City of San Diego, from unincorporated San Diego County. On July 18, 1984, in an event known as the San Ysidro McDonald's massacre, James Oliver Huberty, a 41-year-old former welder from Canton, Ohio, committed a mass-murder of 21 people inside of a McDonald's restaurant in San Ysidro. The McDonald's site was razed in 1985. The site is now home to a Southwestern College satellite campus. South San Diego is within the southern area of the City of San Diego, in far southwestern San Diego County. Land-wise, it is physically separated on land from the rest of the city of San Diego by the cities of National City and Chula Vista. However it and the rest of San Diego are connected by a 400-foot (120 m)-wide city boundary line that runs through San Diego Bay, thus making it possible to travel (by water only) between central San Diego and South San Diego without ever leaving the city limits. South San Diego's boundaries are the city of Imperial Beach on the west, Chula Vista to the north, Otay Lakes to the east, and the U.S.-Mexico border with Tijuana on the south. Brown Field Municipal Airport is located in the Otay Mesa region of South San Diego. As of 2010, the population of South San Diego was 107,631, or 8.2% of San Diego's total population. This breaks down into 65,435 people in Otay Mesa-Nestor, 28,707 in San Ysidro, 13,446 in Otay Mesa and 43 in the Tijuana River Valley. The ethnic makeup was 12.9% non-Hispanic White, 11.7% Asian/Pacific Islander, 4.6% Black and 2.5% Other. 68.1% of the population was Hispanic or Latino of any race. The median household income varied significantly by neighborhood. In Otay Mesa it was $97,694, in Otay Mesa-Nestor $54,776, and in San Ysidro $32,800. Neighborhoods of South San Diego defined by the City of San Diego. The City of San Diego groups these neighborhoods into larger sections for planning purposes. Otay Mesa, Otay Mesa West and Ocean View Hills are combined as Otay Mesa. Nestor, Egger Highlands and Palm City are combined as Otay Mesa-Nestor. San Ysidro and Tijuana River Valley are not grouped. South San Diego is served by the Sweetwater Union High School District. In addition to the schools listed below, there are 13 public elementary schools. Seven are part of the South Bay Unified School District and six are in the San Ysidro School District. ^ Spencer, Jay (2009). The Airplane: How Ideas Gave Us Wings. HarpersCollins. p. 105. ^ "20 Years later, San Ysidro McDonald's massacre remembered". North County Times. ^ "Community Planning Areas - SD City". San Diego Association of Governments. Retrieved 13 April 2011. ^ "City of San Diego - Southern Neighborhood Map".